Although we don’t get the chance to do it often, today we invite you to take a break with us! Today you don’t have to buy anything, it’s not necessary to use our coupon and you don’t have to watch our videos, fill out registration forms, or visit other website on beruby. Although we don’t get the chance to do it often, today we invite you to take a break with us! Today you don’t have to buy anything, it’s not necessary to use our coupon and you don’t have to watch our videos, fill out registration forms, or visit other website on beruby. Put down your mouse and spend the rest of the day with your loved ones, enjoy your dinner because is Christmas! So celebrate, because you have all day to berubier! But, in all seriousness, beruby wants to wish you, and all berubiers alike, a very happy and memorable holiday. 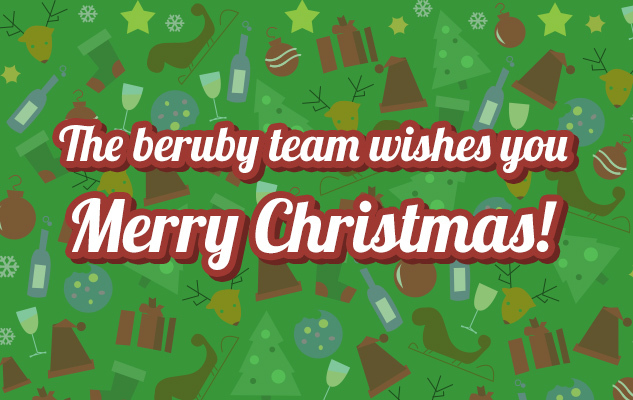 The beruby team would like to thank you for all that you have shared with us throught the years. We wish you all a very happy holiday and a happy start to 2014!